Picture of Miss Cromarty c1950?? Could Miss Cromarty in this picture be May Cleland? Back row 2nd left Florence Gillies, Bridie ?, Catriona Gillies, Jenny Hives? 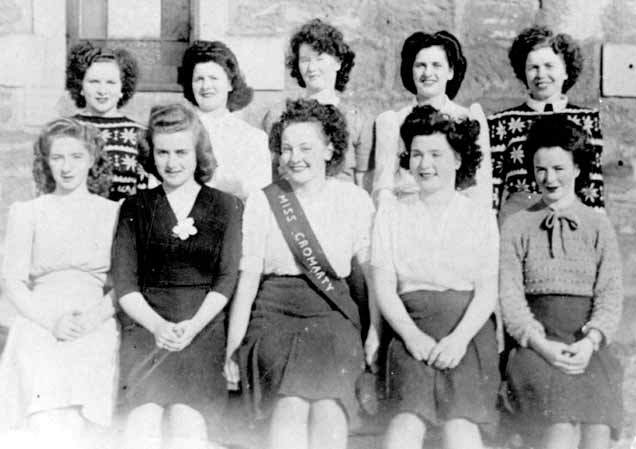 Front Row 2nd left Mona Mackenzie, Irene Mackenzie, Alice Robertson & ? 1st left Margaret Hives, Bridie Dodie and bottom left is Cathy MacKay (wife of Roddy). Far right is Violet MacLean. had two other sisters namely Elisa & Jenny. All had beautiful red/auburn hair. Jenny Hives runs THE COMMERCIAL BAR in the High Street in DINGWALL, I noticed that it's closed just now due to illness. My mother was in school with Jenny and her family, I hope that Jenny is not too ill and also hope she gets better soon. She has a wee terrier for company he will be wondering whats happening as the two would be out and about every day. This is a photo of the Cromarty Top Ten and Miss Cromarty. In 1947 there was a competition throughout Scotland called The Top Tens. A dance was held in the Victoria Hall and 4 judges were there to choose Miss Cromarty. The winner was Irene Mackenzie, the Police sergeant’s daughter. Irene now lives in Ratho and we are in touch due to her great friendship with my mother, Babs.